A masterful biography of a key figure in twentieth-century African American history"Logan (1897-1982), the subject of this superb biography by Kenneth Robert Janken, was a gifted intellectual, important Pan-Africanist, bold civil rights crusader, and highly productive historian.... 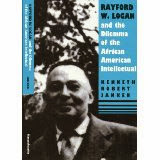 Among the best in a sizable body of first-rate studies devoted to the lives of African-American leaders, Janken's biography is certain to gain for Logan the recognition that persistently eluded him during his lifetime.... Based upon impressive research especially in the previously untapped Logan papers, and written with extraordinary grace, this multidimensional biography provides a sensitive and incisive analysis of the career, intellectual development, and complex personality of an important scholar/activist". -- Journal of American History"Janken's well-written biography based on Logan's work, letters, diaries, and autobiography, vividly brings back to life the struggles of the Talented Tenth in the early twentieth century". -- American Historical Review"In his frank and thorough biography ... Janken provides a window on the history of black intellectual life of the 20th century". -- Washington Post Book World"Scrupulously fair and intellectually astute.... A frank, well-founded assessment not only of personalities, but also of agendas and the dynamics of power in the top tier of black America at midcentury"